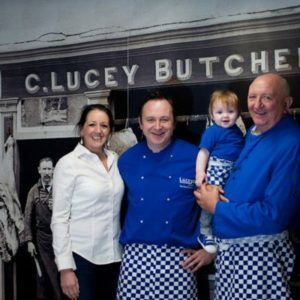 The Lucey Butchers family tradition begins in 1860 in Bandon, West Cork. The business spans five generations and today has diversified into fish, wine, deli and catering services. Knowledge of the Lucey history is very important to the current generation of Luceys. The traditional aspect of the business is one of great pride. The Luceys realize the great contribution past generations have made. They hold firm the virtues of old, while looking forward to tomorrows customers and their demands. In 1860, John Lucey, on his return from Philidelphia, opened a butcher shop in Bandon. 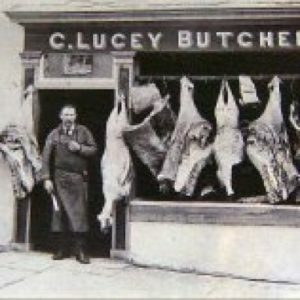 His son Con Lucey moved to Mallow and opened his butcher shop at 27 O Brien Street in 1880. In 1898, Con married Bridget Donovan and had six children. 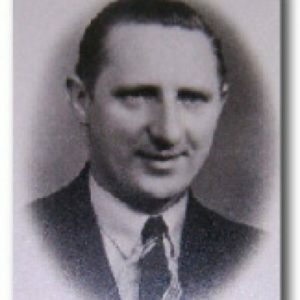 In 1917, Con died leaving his eldest son, John, of ten years of age, to stay at home and help with the family business. John worked hard and long hours in the business. It became his life. From ten years of age he knew nothing else, his life was butchering and the town of Mallow. The business was a family affair, with sisters Madge and Annie helping out while uncle Denis Donovan came in to buy cattle. In 1944 John married Kay Healy from Lombardstown. They lived for a short time in O Brien Street, moving eventually to 57 Main Street. This was a co-op at the time, with a bakery to the rear and nurses quarters overhead. These nurses quarters were then converted into a home, where John, Kay and their ten children lived. In keeping with tradition, the business was very much family orientated, with everyone lending a hand, from working on the farm, to the shop, from early till late. 57 Main Street became work life, home life and social life. The shop was as much a meeting place for locals as it was a place of business. Mother Kay would hold court in the kitchen, to the back of the shop, where all were welcome for a bowl of soup or a cup of tea. John was at the forefront of innovations and he was one of the first butchers in Munster to have an all tiled shop, refrigeration, and a stainless steel counter. 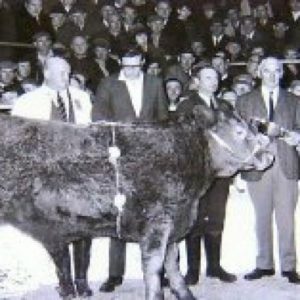 John passed away in 1987, leaving the running of the business and the farm to his eldest son Con Lucey. Con saw the business through challenging times, adjusting constantly to changing consumer habits and lifestyles. Con positioned the business more towards solving customers food dilemmas. He began thinking more of what the consumer wanted, moving away from just the raw material. He introduced a range of sauces, cooked vegetables and meat pastries in an effort to create different meal solutions. He entered competitions winning numerous awards for his food innovations. He traveled overseas gaining valuable knowledge that is still utilized today. In 2002, Cons son, Ian, after successfully completing a degree in food business from University College Cork, took over the family enterprise. He is still working to improve and develop the family business, aiming to realize future opportunities, and remember past traditions. In December 2013 Ian and Elaine’s first son John was born. Then in November 2015 they welcomed their second son Tom. The sixth generation of the Lucey tradition.